In the DepEd, a Learning Action Cell (LAC) is a group of teachers who engage in collaborative learning sessions to solve shared challenges encountered in the school facilitated by the school head or a designated LAC Leader. LACs will become the school-based communities of practice that are positive, caring, and safe spaces. In line with the implementation of Republic Act No. 10533, or the Enhanced Basic Education Act of 2013, the Department of Education (DepEd) issues the enclosed policy on The Learning Action Cell (LAC) as a K to 12 Basic Education Program School-Based Continuing Professional Development Strategy for the Improvement of Teaching and Learning. Through this policy, the DepEd fully supports the continuing professional development of its teaching personnel based on the principle of lifelong learning and DepEd’s commitment to the development of teachers potential aimed towards their success in the profession. This can be done through the school-based LAC, which primarily functions as a professional learning community for teachers that will help them improve practice and learner achievement. This policy will remain in force and effect unless sooner repealed, amended, or rescinded. All issuances inconsistent with this Order are hereby rescinded. As an institution of learning, the Department of Education (DepEd) works to protect and promote the right of Filipinos to quality basic education that is equitable, culture-based, and complete, and allows them to realize their potential and contribute meaningfully to building the nation. The investment of the DepEd in the development of human potential is a commitment it makes not only to its learners but also its teachers. Towards this end, the DepEd fully supports the continuing professional development of its teaching personnel based on the principle of lifelong learning and the view of the teaching profession as one that “requires teachers expert knowledge and specialized skills, acquired and maintained through rigorous and continuing study” (UNESCO 1966). The DepEd also recognizes that the quality of learning is greatly influenced by the quality of teaching. Therefore, it is imperative for the DepEd to hire good teachers and to support their development in the teaching profession. Organizing professional learning communities will aid teachers in the construction of new knowledge about instruction as well as in revising traditional beliefs and assumptions about education, community, teaching, and learning (Little 2003) to suit the present needs of learners. Affirmative bases for this policy are also drawn from the learnings of many interventions in education such as the Program for Decentralized Education (PRODED), Third Elementary Education Project (TEEP), Secondary Education Development and Improvement Project (SEDIP) as well as empirical studies on similar professional development programs that demonstrate that teachers’ participation in professional development activities have a positive impact on teachers’ beliefs and practices, students’ learning, and the implementation of educational reforms (UNESCO ISO 2006). Successful teaching is a result of the systematic use of appropriate strategies for delivering and assessing the learning objectives targeted for each lesson (UNESCO GMR 2014). Successful teachers 1) possess a good grasp of content which they can consequently convert to sound learning objectives, 2) are able to select and implement the most effective instructional strategies and materials to teach the identified content objectives, 3) make instructional decisions on the basis of formative assessment results, 4) promote sincerely their students’ learning and holistic development, and 5) are professional and ethical in the conduct of their work (Stronge 2007). Different methods of teacher professional development are implemented throughout the DepEd to improve teaching-learning processes. However, most of these are top-down processes wherein expert knowledge is shared or transferred. Examples of these are lectures or workshops during cascaded or echoed teacher training and short-term courses. Other top-down training programs are done over time such as scholarships, and distance learning programs. Though existing in some schools or divisions in the DepEd, there are fewer instances of bottom-up teacher professional development programs where colleagues study content and pedagogies together, plan lessons collaboratively, and conduct action research as a group. Examples of these are school-based learning action cells, teaching circles, communities of practice, and lesson study. Good educational systems ensure that opportunities for both approaches to professional development programs are available and accessible to teachers (Whitehouse 2011). It is therefore incumbent upon the DepEd to ensure teachers’ continuing professional development (CPD) within the framework of School-Based Management (SBM) and embodied in the School Improvement Plans (SIPs). As such, this policy highlights the fact that the locus of learner development is at the school where deliberate measures must be taken to improve student learning outcomes. In effect, action points that directly address the quality of teaching-learning processes must be included in the SIP. The space and opportunities for teachers to collegially discuss strategies that will lead to better teaching and learning processes can be integral to SIPs. Further, this policy reiterates that good teaching is the primary job of teachers and supporting CPD is one of the most vital functions of school heads/principals. In this policy, the DepEd institutionalizes Learning Action Cells (LACs) that aim to develop and support successful teachers by nurturing their knowledge, attitudes, and competencies in terms of curriculum, instruction, and assessment in their work stations. In the DepEd, a Learning Action Cell is a group of teachers who engage in collaborative learning sessions to solve shared challenges encountered in the school facilitated by the school head or a designated LAC Leader. LACs will become the school-based communities of practice that are positive, caring, and safe spaces. to foster a professional collaborative spirit among school heads, teachers, and the community as a whole. LACs are the most cost-effective CPD process but may entail some expenses for meetings and handouts. Funds for the LACs may be sourced from the school’s Maintenance and Other Operating Expenses (MOOE), subject to its utilization guidelines. Other resources may be generated by the school or schools divisions to support LACs as these endeavor to upgrade the quality of teaching and learning in their respective schools. This policy provides the framework and enabling mechanisms for the conduct and implementation of LACs in schools or in clusters if multigrade schools prefer to conduct them by cluster. It is directed towards improving teacher knowledge, skills, and attitudes based on established competencies linked to the K to 12 Curriculum. 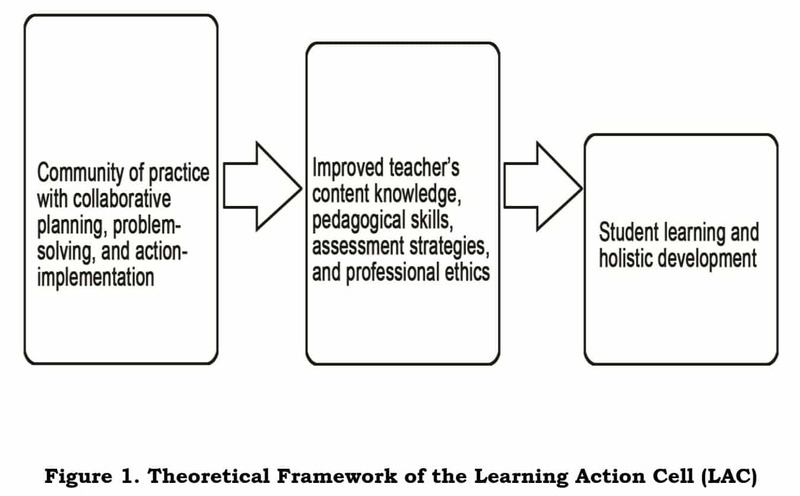 The theoretical framework in Figure 1 shows that communities of practice, in this case, LACs, enable teachers to do collaborative planning, problem solving, and action implementation that will lead to improved teachers’ knowledge, skills, and attitudes that will consequently and significantly improve student learning and development. The content of LAC sessions may be determined by the teachers themselves under the general guidance of the school head or LAC leader. This may be done through needs assessment, the results of which should assist the LAC in listing their priority areas of learning. Successful teachers know and care for their students. Including learner diversity and student inclusion in the LAC sessions emphasizes that learners are the reason for all education processes. It is the central role of teachers to establish learning environments that are responsive to learner diversity. It underscores the importance of teachers’ knowledge and understanding of, as well as respect for, learners’ characteristics and experiences. Diversity emanates from a variety of factors (which may be in combination) such as gender, community membership, religious beliefs, family configurations, and special learning needs. Teachers who celebrate diversity in their classrooms adjust and differentiate their instruction to include all learners and to foster harmony in their class. Furthermore, learner inclusion requires that teachers provide remedial instruction for those who are experiencing difficulties in learning lessons. Such interventions prevent failure and communicate caring by the teacher for students. By studying the K to 12 curriculum, teachers will be better able to prepare for lessons and will be more relaxed in executing lesson plans. Only a confident teacher is able to implement developmentally-appropriate teaching methods that respect the individual differences of learners. Additionally, they can jointly craft learning goals in collaboration with their students. Content and performance standards and learning competencies must be mastered by teachers so that they can plan lessons, deliver instruction effectively, and assess the learning that resulted from their teaching. Teachers can collaboratively plan weekly lessons during the LAC and these can be implemented for the specified period of time, after which, teachers can share their experiences to improve subsequent lessons. While boosting teachers’ own critical and creative thinking, their skill in translating curriculum content into relevant learning activities also grows. Student learning will improve because the teacher will be more systematic and better contextualized to the learning needs of students. Every teacher should understand how to implement the learner-centered assessment policies for the K to 12 Curriculum. Discussions about lessons should necessarily include ways in assessing the learning of students and how data from formative assessment can improve subsequent lessons. Assessment provides teachers and learners with the necessary feedback about learning outcomes. This feedback informs the reporting cycle and enables teachers to continually select, organize, and use sound assessment processes. Bringing 21st-century skills into the teaching and learning situation is a central feature of the K to 12 Basic Education Program. Teachers must enrich lessons with simple integration strategies utilizing Information and Communications Technology (ICT) that are developmentally appropriate. Instruction and assessment processes can be made more collaborative with ICT, which teachers can implement with the tools and equipment available in their schools. Curriculum contextualization is the process of matching the curriculum content and instructional strategies relevant to learners. Student diversity requires that teachers always consider individual differences in lesson planning and implementation. Teachers identify and respond to opportunities to link teaching and learning in the classroom to the experiences, interests, and aspirations of the wider school community and other key stakeholders. By linking new content to the local experiences that are familiar to students, learning will be more efficient for and relevant to them. The localization of curriculum is an essential feature of the K to 12 Curriculum. The teacher’s guide and learners’ materials may be modified to accommodate the unique contexts of a particular locality. Deepening curriculum contextualization through indigenization is essential for communities that have cultural practices that are different from the majority of people in the same locality. Providing spaces for unique cultures in the K to 12 Basic Education Program is a key strategy for student inclusion and ensuring relevance of education processes for all learners. Teachers and school systems must make sure that the members of the community participate in indigenization processes, so that the curriculum will be accurate and faithful to the culture in consideration. In addition to the topics that the LAC members have identified and those enumerated above, teachers should also find time to discuss how their community linkages can support the curriculum and how the LAC sessions promote their own professional growth. Furthermore, emerging and urgent issues or concerns affecting teaching and learning must be discussed during LAC sessions. These may include school data such as school participation, attendance, completion and assessment, child-finding activities, programs to be offered so as to include more learners in schools, results-based practices, and technologies, and school successes. LAC sessions also cover DepEd thrusts and policies relevant to the above-mentioned priority needs. Before the LAC Session. In order to plan for LACs, the LAC members guided by the LAC Leader and LAC Facilitator, are expected to identify professional development needs and prioritise issues to be discussed or addressed in the LAC session. These can be recorded in a LAC Plan, which will also require details on how the LAC process will be monitored. A template for the LAC Plan can be found in Annex 1. Schools can revise the template to suit their own needs and contexts. Needs are identified with reference to the professional teacher standards set for one’s career stage. These needs could be captured through different forms like self-assessment tools, classroom observation results, critical reflections, surveys, research-based teacher development needs, students’ assessment results, and other forms. From the needs that have been identified as focus of LAC, members could agree on which of them should be prioritized for their sessions. The basis for prioritization could be in terms of urgency of need, time needed in addressing the need, interest or in whatever way agreed upon by the members of the group. These priority needs or topics could integrate the areas mentioned above. Every teacher must be part of a LAC. LACs could be formed based on the prioritized need(s) and depending on the number of teachers in every school or cluster of schools. However, these groupings are flexible according to need and context. One LAC could be composed of five (5) to 15 members. A school may organize as many LACs as may be deemed necessary depending on the identified needs of the school. In all schools, teachers may convene in groups that are strategically decided. These may be by key stage, grade level, learning area, or programs offered by the school. Multigrade schools may be clustered in different ways by the district or division supervisors based on the objectives of the LACs to be conducted. 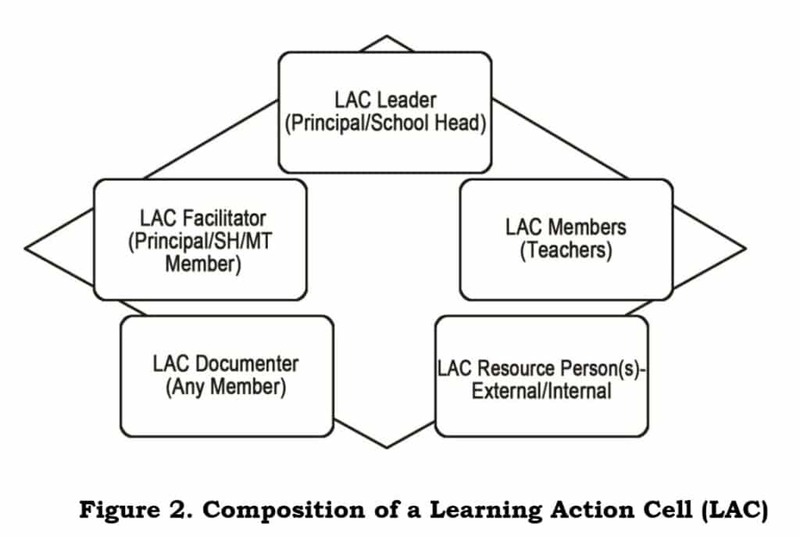 Each LAC should have a leader, a facilitator, a documenter, and members as shown in Figure 2. External resource persons may be invited when necessary though the preference is for the LAC resource persons to be from among the LAC members. The terms of reference (ToR) for LAC participants are found in Annex 2. The LAC could agree on exploring interventions to address the identified need. Interventions could be in the form of learning materials, instructional materials, equipment, facilities, strategies in teaching, modality in teaching, program, etc. The LAC members can decide on the schedule, length, and frequency of meetings. One to two hours a week is strongly recommended but the diversity of teaching conditions may not always allow this. LAC sessions, however, should be conducted at least once a month. Interactions may also be done through ICT when it is difficult to have face-to-face sessions, particularly when involving clustered schools. There is a need to prioritize the LACs because this is the support system for teachers who are tasked to deliver basic education, which is the core business of DepEd. Activities that do not support this mandate must not take priority over the learning needs of students. Finally, all schools are encouraged to prioritize LAC sessions instead of administrative meetings, which should be scheduled separately from LAC sessions. Resources could be human or material that should be prepared or set up before the implementation of the sessions. The human resources could be individuals who are tapped as resource persons of the LAC sessions. Material resources could be the supplies, worksheets, videos, equipment, budget, food, venues and other things needed in the conduct of a LAC session. The LAC Leader or School Head shall take the lead in identifying the needed resources, ensuring their availability and sustainability. The LAC members could be given specific roles to perform during LAC sessions. These roles could be rotated among the members of the group. Time and Venue: Where and when will we meet? Will we start on time? Listening: How will we listen to our peers? How will we discourage interruptions when someone is speaking? Confidentiality: What content is to be held in confidence? What can be shared after the meeting? Decision Making: How will we arrive at a decision? What if everyone doesn’t agree with the group decision? Participation: Is participation optional? Will we have an attendance policy? What will we do if a member constantly misses meetings? Expectations: What do we expect from team members? Do we need a method for ensuring each member comes to the meeting prepared with appropriate data or other assignments? The budget shall come from the school’s respective MOOE and other external grants, provided that only expenses allowed under the school MOOE may be included, subject to existing accounting rules and regulations. For a guided implementation of LAC plans, they should be written and documented following the template in Annex 1. Schools are allowed to modify the template based on their needs. This plan should be integrated or linked with the School Improvement Plan (SIP) or Annual Implementation Plan (AIP). The priorities set out in the LAC Plan are implemented through a variety of activities, which can include stimulus (e.g. lectures, practicum, orientation, coaching, workshops, development and utilization of instructional materials, etc.) followed by collaborative discussion of possible ways forward. The final activity of the session will involve individual and group action planning in order to implement agreed activities in the classroom. LAC members are expected to implement the proposed strategies or activities in their classroom or school or community as appropriate and evaluate their success. LAC members should be prepared to report back on the success of these activities in future LAC sessions. LAC facilitators and LAC leaders should monitor these activities and evaluate how far they are contributing to improved outcomes for learners at school. School heads or principals should support the LACs by doing class observations and encourage teachers to continually improve instruction so that student learning will also improve. At the school level, the School Head should lead in organizing the LAC and in ensuring that the practice of holding regular LAC sessions is established, maintained, and sustained. The School Head should also take the lead in monitoring school LAC activities and in evaluating their impact on the total school improvement. Likewise, active participation of teachers and involvement in various LAC activities should be captured as an objective in the Individual Performance and Commitment Review Form (IPCRF). It is expected that school heads or principals will be vital in facilitating and implementing effective LACs within their schools. This function will be included in the performance evaluation of school heads. They will create safe spaces where teachers can engage in dialogue with each other so they may learn from and provide support to one another. Providing administrative support and academic leadership to the LACs will strengthen the schools’ development of professional learning communities that value their communities of practice in favor of student learning and holistic development. Through and with the District Supervisor, the Schools Division Office (SDO) Curriculum Implementation Division (CID) should support the schools in establishing, maintaining, and sustaining their LAC practice. It should provide technical assistance (TA) as may be required. The SDO shall lead in identifying practices that are potentially replicable as well as in highlighting accomplishments and setting up reward systems. SDO personnel are expected to provide technical assistance to schools and conduct systematic monitoring so that good teaching happens in all classrooms throughout the country. The SDO should also find ways to encourage the schools to conduct action research about pedagogies and assessment methods that successfully support student learning and holistic development. The SDO is also expected to ensure that there are LAC plans across all the learning areas and key stages as this is consistent with the DepEd’s mandate to ensure good quality teaching for all subjects and all students. When organizing LACs sessions at this level, District and Schools Division Level LAC may also be constructed flexibly, but could include any of the following: teachers, district supervisors, division supervisors, and school LAC leaders. These LACs may have a variety of purposes which are agreed upon strategically at a local level. The Regional Offices (ROs) through the Curriculum and Learning Management Division (CLMD) should provide more explicit guidance to SDOs and schools regarding the conduct of LACs. It should provide TA to the SDO that enables them to support the schools in their LAC practice. It should also be able to scale up practices that are found effective and conduct research for this purpose. The RO shall also conduct a regional event to highlight and reward LAC accomplishments. The ROs should monitor school data over time and see if the LAC sessions are effectively improving teaching and learning processes. When organizing LAC sessions at this level, the membership may be constructed flexibly depending on the purposes of the LAC and the strategy agreed upon. The Central Office (CO) shall review the policy and its implementation in light of the feedback gathered from the field. The CO through the Office of the Undersecretary for Curriculum and Instruction shall coordinate efforts at the central and field offices to ensure that the support systems and mechanism to sustain LAC practice are established and responsive such as putting in place a rewards system and allocating funds for the program. Schools or school clusters will need to be given time to establish effective LACs. The process of professional learning and subsequent developments in teachers’ quality will vary from school to school and cannot be easily quantified. changes in teachers’ pedagogy or practices which are aimed at improving learners’ participation and achievement in school. effectiveness of the implemented strategies. Purpose. The purpose of progress monitoring is to provide everyone concerned with the pertinent information about the activities so far conducted and whether the standards are met in the process of the implementation in terms of quality, quantity, and time leading to the attainment of the goals and objectives of LAC. This feedback mechanism helps the LACs to decide on the direction to take and the adjustments to make in the continuing implementation of the LAC. Areas to be monitored. LACs should be monitored on the components of the focus area (stipulated in the LAC Policy). For example, if the LAC was formed in the area of content and pedagogy, components to be monitored can include members’ a) content knowledge; b) skill in particular instructional strategies; c) skill in assessment; and d) knowledge of learners and how they learn. Monitoring the LAC’s progress can also be based on the protocols agreed upon by the group for the implementation phase. For instance, the LAC Team Norms can be the bases for monitoring attendance and participation, working relationships, teamwork, professionalism, and efficiency. Monitoring methods and tools. The members of a LAC should collaboratively develop a variety of methods and tools for progress monitoring. These can include, among others, a) individual members’ monitoring or assessment of their own activities; b) peer observation or assessment; c) observation or assessment by supervisor or mentor or coach; and d) monitoring or assessment of the LAC team. LACs following a particular model (e.g., Lesson Study, Competency-Based Collaborative Inquiry) will have protocols unique to the model. Appropriate monitoring tools similar or in addition to those above should be developed. Monitoring timeline. Progress monitoring is a continuous process throughout LAC implementation. Data gathering and assessment should be done from the beginning of implementation through the stages of development, growth, and sustainability of the LAC. Documentation, record-keeping, and reporting. Monitoring can only be effective if data or evidence collected are authentic, valid, and sufficient. Thus, documentation and record-keeping are vital aspects of the monitoring process. Individual and team activities should be properly documented, with appropriate tools. Team meetings. Proceedings of team meetings should be recorded. A template for easy recording can be developed. This should include, among others: a) attendance; b) topics of discussion; c) best practices that were shared during the meeting; d) current or emerging needs and concerns (which should immediately be communicated to the LAC leader); f) evidence of whether Plan is working or not working; and g) next courses of action to be taken. The appointment of documenter or recorder of minutes should be on a rotation basis. Protocols should be developed for confidentiality or which items should be confidential and which can be shared after the meeting. Guidelines should be developed on record management: a) Who should keep the files; b) where should files be kept; and c) who should have access to the files. Each LAC member should build a portfolio about all activities related to the LAC. Members can keep individual notes on a form developed for the purpose. It can include items about what the LAC member will need to do as a result of agreements in the meeting and notes on what to bring for the next team meeting. Members can also keep logs and reflective journals on the actions they have taken in their respective classes towards the achievement of LAC goals. These will be used in sharing of best practice, problems or solutions during the team meetings. Support mechanisms, both hardware and software, for documentation and record-keeping should be put in place. Reporting to administration or system. LAC members should agree on protocols and timetables for formal reporting of LAC implementation to the system. The October in-service training (INSET) of the District or Schools Division would be a good venue for sharing the LAC experience. Assessment during milestone points (e.g., mid-year, year-end) can make use of tools used in the planning stage. Conduct of the LAC Session. Limitation/Prohibitions. Since LACs and LAC sessions are aimed at the continuous professional development of teachers, the conduct of LAC sessions shall be limited to the purposes stated in this policy. The holding of LAC sessions for purposes other than those provided herein is prohibited. Prohibited purposes may include but shall not be limited to the following: sale of goods and other merchandise; lending transactions; political and religious meetings and other purposes which are not included in this policy. Little, Judith. 2003. Professional community and the problem of high reform. International Journal of Education Research 37 (8), 693-714. ILO/UNESCO. 1966. Recommendations concerning the status of teachers. Stronge, James. 2007. Qualities of effective teachers (2nd Ed.). UNESCO ISO. 2006. Teachers and educational quality. Learning: Achieving quality for all. Whitehouse, Claire. 2011. Effective continuing professional development for teachers. Manchester, UK: Center for Education Research and Quality. Monitors the LAC implementation vis-a-vis the school LAC plan. Runs and facilitates the session based on the plan and ensures that the agreed norms of behaviour are observed and that the objectives of the session are achieved. Provides the LAC leader with evidences of application of learning. Gathers evidences of implementation (e.g., individual plans, etc.). Helps the LAC plan subsequent action based on the session. Thanks Sir sa mga educational Information.